The important thing in riding a bicycle is making sure drivers see you and give you plenty of room. I find it amazing that as big as most cars are, drivers still have accidents with other cars because they "didn't see the other car coming". These automotive auxiliary drivings lights use the same bulbs used in slide projectors and outdoor landscaping lights. The first light set is the Eagle Eye Driving/Fog Lights, which come with 20-watt (1.7 Amp) MR-11 bulbs. The second light set is the Optronics QH-7CC Competition Series Round Driving Lights, which come with 50-watt (4.1 Amp) MR-16 bulbs. As a comparison, most automobile headlights use 55-watt halogen bulbs. In addition to a pair of headlights, I'm adding a second set of auxiliary driving lights for use as daytime running lights. I'll replace the 50-watt MR-16 bulbs with wide-beam LED bulbs that uses 0.1 amps each, but will be as bright as two 10 watt halogen bulbs. The LEDs will act as daytime running/low beam headlights, and I'll save the 20 watt (1.7 Amp) headlight set for use as high beams. This is the same tail/brake light you normally see on large trucks. It has 56 red LEDs, operates on 12 volts, uses 0.040 Amp (40ma) for the tail light or 0.300 Amp (300ma) for the brake light, and the LED area measures 2.1 by 6 inches. Depending on how it's wired, I can have 56 LEDs at half-brightness (the normal tail light mode) or 56 LEDs at full-brightness (the normal brake light mode). I have th taillight mode wired as part of my normal running lights. The brake light mode is wired into a separate circuit with a flasher. When I brake or need to make drivers behind me really take notice, the flashing lights should get their attention. This is the same amber clearance light seen on semi-trailers. It has 12 amber LEDs, operates on 12 volts, uses 0.065 Amp (65ma), and the LED area measures 1" by 3". I have two on each side (front and back), just like a car. This yellow strobe light	is the same kind found on alarm systems and in irritating store window displays. It operates on 12 volts, has a bright Xenon bulb, and uses .2 Amp (200ma). I installed it on a piece of conduit so the light is 6 feet off the ground, which is about SUV driver eye-level. I plan to use it in hilly areas (everywhere around here) so when I crest a hill and start downward, a part of the bike is still visible for a split-attention-getting-second. Most flashing bicycle taillights have anywhere between 3 to 6 LEDs and operate on AA batteries. Older bicycle taillights used a flashlight bulb and a small generator; stop pedalling and the taillight goes out. Both styles are typically less than 3" in diameter. Depending on surrounding bright lights, both of these can fail to attract a driver's attention, but they do attract attention when there's nothing else around. The low cost and easy portability are other great features. No excuse for not using one. The typical bicycle reflector is angled to reflect light to different directions. Unfortunately, about 1/3 of this reflected light is directed towards the driver of the car behind you; the rest is directed towards any bystanders in the immediate area. Two excellent resources on bicycle lighting are cycling safety expert John Allen's page on bicycle lighting and Steven Scharf's Bicycle Lighting Systems. I have one of these because U.S. federal law concerning bicycles [16 CFR PART 1512.18(m)] specifies a type of reflector that directs light from the rear of the bike (a car headlight 100 feet behind you) up to a 50 degree angle left and right either side, with various brightness levels at various angles. For a red reflector, brightest candlepower requirement (per foot-candle) is 6.75 lux shining back to the headlight, and 1.5 lux to the 50 degree angle (the guy standing on the sidewalk). This reflector is the only style made that meets those standards. Of course, it's also the only style that is actually tested using those pitiful standards. "But officer, I have a CPSC approved reflector on my bike. You just didn't see it because the automotive reflectors all around it are so much brighter." Automotive reflectors meet U.S. standards in [49 CFR PART 571.108], which specifies candlepower requirement of 60 lux for red (0-30 degrees) and 15 lux at 45 degrees. Amber reflectors require 168 lux for 0-30 degrees and 40 lux at 45 degrees. These reflectors are superior in terms of brightness compared to the standard bike reflector, and are tested using automobile standards, but since they're not tested to the 50 degree angle, they actually don't qualify as meeting the minimal bicycle reflector standard. Testing costs money, and so do good reflectors. I have two amber reflectors on each side, and two red and two amber reflectors facing the rear. These reflectors are 1" wide and 12" long. I use the white reflectors (or white reflector tape) on the sides and front of the bike. Bicycle flags help provide visibility by rising higher than possible nearby obstructions. A cyclist riding next to a row of parked cars, for example, would tend to "blend in" with the surroundings, especially if they're hunched over pedalling furiously. A flag waving above the row of parked cars helps to say "watch out". Flags made specifically for bicycles are available in all kinds of standard colors (black, green, blue, red, orange, yellow, white). Fluorescent colors can add even higher visibility, and are available in red, orange, yellow, green, and pink. 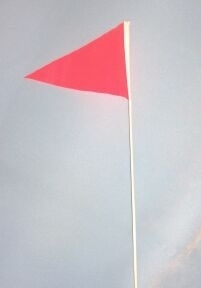 A windsock on your flagpole is another way to be different and noticed. If everyone around you also uses a windsock, then you won't be different, just noticed. A reflective triangle (also known as a 'slow moving vehicle emblem') tells drivers your massive display of reflective material isn't a rural mailbox by the roadside, it's a slow moving vehicle. "I may be slow, but I'm ahead of you." Reflective safety vests are great for visibility, especially when riding a touring or commuter style bicycle. The visibility factor drops when worn by riders hunched over handlebars or when hidden by seat backs or luggage piled high. Reflective gloves help drivers see your hand signals when you turn or brake. Not using hand signals? Not signalling at all? If you think the world revolves around you and drivers can simply read your mind about your intentions (turning left, turning right, stopping), then you're a MORON! Sell your bike. Don't forget to look both ways and hold your mother's hand when you cross the street. I wear a helmet, although I'd rather wear a hat that provided better protection from the sun. I have reflective tape to help with the visibility. Beginning of My New BikeBike Pages.